Football season has started, which for me means lots of knitting because I watch lots of football. And I cannot sit in front of the TV for long without either knitting or spinning. First things first, I finished the Gray Vanilla Socks I was knitting for my DH. I know, the picture is crappy. What can I say? I’m a lousy photographer, and I’m too lazy to try again. I’d probably just end up with more lousy pictures. I had 3 50-gram balls of Socka, but I managed to knit these socks with only one ball per sock and even had a few yards left over. Usually 100 grams of sock yarn isn’t quite enough to knit a pair of socks for the DH. He likes the cuff to be a little on the long side–about two inches longer than what I knit for myself–and the foot is about an inch longer than mine, and I usually cast on 8 more stitches than I do for my own socks. So whereas 100 grams of sock yarn is plenty for knitting a pair of socks for myself (and for the other sock-worthy women in my life), it’s usually not sufficient for a pair of socks for my DH. These socks are just plain, old 2 x 2 rib with a Fish Lips Kiss Heel and a round toe, utilitarian rather than decorative, so I’ll have to dig around in my sock yarn stash and find something a little more splashy for the next pair I knit for him. He rather likes socks with a bit of flair. Socks are just the beginning of my knitapalooza. For me, football season and hockey season are knitting season. September 5th was the first Saturday of the college football season, and although it wasn’t as productive as it normally would have been because we had a wedding to attend and didn’t get back home until mid-afternoon, I did get a good start on a pair of fingerless mitts knitted with Cascade 220. 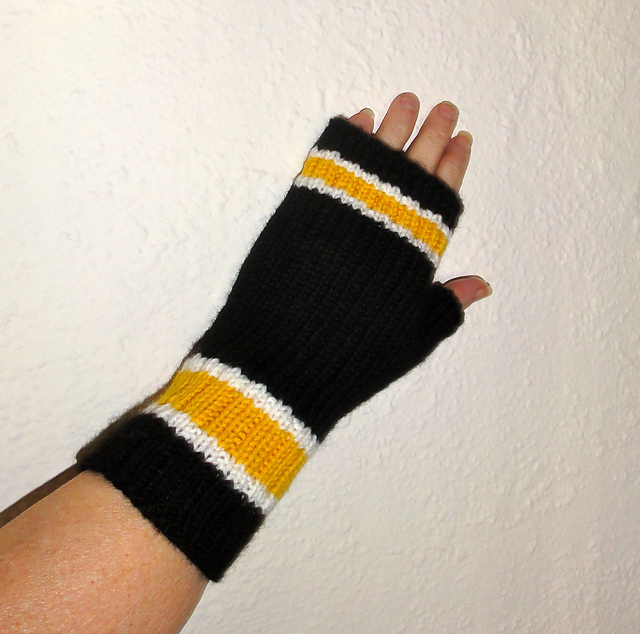 I used the Center Ice Mitts pattern, a free download on Ravelry, but with Steelers colors. I really like this particular pattern. It’s well written and includes options for using either two or three colors, so it can be adapted to just about any team in just about any sport. I prefer Brown Sheep Nature Spun to Cascade 220 for knitting hats and mitts, but I had Cascade 220 in white and yellow in my stash already, and only had to buy one skein of black. Unfortunately, after knitting about half of the first mitt, I tried it on and decided it was a little too tight. I ripped it out and started over with a needle one size larger. Don’t tell me that I should have swatched first; in the time it would take to knit a swatch, I can knit half a fingerless mitt, so the mitt is my swatch. Anyway, during football weekend #1, I finished the first mitt sans thumb and got a good start on the second mitt. The second Saturday of college football was shaping up to be a very productive knitting day, but we ended up having the DS and DIL here to watch football, and the DIL and I decided to walk up to the boulevard to get tacos, and then we got caught in the rain and thought we’d wait it out in the library. But after about 10 minutes in the library, we realized the rain wasn’t going to let up any time soon, so we walked back in the rain, the whole time kicking ourselves for not bringing an umbrella. But I still got Steelers mitt #2 completely done, and got the thumb knitted on mitt #1. Steelers on Ice with thumbs. This pattern is quick and easy. The most difficult and time-consuming part is weaving in all the ends. These mitts should be nice and warm. and I cast on for another pair of fingerless mitts. I love the pretty autumnal colors of the yarn, so I am calling them Autumn Leaves Mitts. I got the first mitt sans thumb finished on Sunday while watching NFL games, and even got a good start on the second mitt. Mitt #1 just needs a thumb, and mitt #2 is off to a good start. I’m trying to get the mitts as close to matching as I can. With handspun yarn, the color repeats are not as precise as they would be with mill spun, commercially dyed yarn, or even with mill spun, hand dyed yarn. I don’t expect total matchy-matchy identical twins, but I would like to end up with obvious siblings. The pattern I’m using for the Autumn Leaves Mitts is Braided Mitts by Tera Johnson, and it’s a free Ravelry download. The pattern as written makes a mitt that is too small for my hand (and I have fairly small hands), so I had to make a couple of modifications to the pattern. I knitted a 2 x 2 wrist cuff for 24 rounds instead of 12, and I did the thumb gusset repeats at a rate of every 4th round instead of every 3rd round because otherwise, the thumb gusset would be too short. I could have just knitted a bunch of plain rounds after completing the increases before putting the thumb stitches on waste yarn, but I like the look of the diagonal lines the increases create, so I changed the rate of the increases. One of my favorite things about this pattern is that the designer took great care to place the beautiful braided cable so that it is in the center of the back of the hand when the mitts are worn. All to often, a cable will be placed so that it is in the middle of the mitt when the mitt is not being worn, but when you put the mitt on your, the cable will be off center. I’ll work the thumbs when I have both mitts finished. I want to try to use a piece of yarn for the thumbs that will match the hand. I will probably have enough yarn left from this skein to make another pair of mitts. And I have a whole other skein, so I could knit a hat to go with the mitts. Or I might use the leftover from skein #1 along with skein #2 and knit a scarf using Yarn Harlot’s pattern for a scarf knit from handspun. This yarn is BFL, and it is incredibly soft and would feel wonderful around my neck. I’m happy to be knitting again, and it will only get better because in just a few short weeks, hockey season starts. And hockey means more knitting! This entry was posted in Fingerless Mitts, Knitting and tagged BFL, Braided Mitts by Tera Johnson, knitting and football, knitting with handspun yarn, Yarn Harlot Handspun Scarf. Bookmark the permalink. I also knit when I watch TV 🙂 I find it very hard to take photos of my knitting. I love the way you put your Ice Mitts on a plaid background. Very classy! Knitting and TV are made for each other. The plaid background is just the kind of grungy seat cushion of our aged couch, and it just happened to be the closest surface. Unlike you, I have no eye for photography. You, on the other hand, take pictures that take my breath away. I love your hand spun yarn. All my favorite colors in one yarn!!! The sports mitts look so smart, even if the colors are all wrong! A nice Green Bay combo would have been lovely. Thanks. I agree the sports mitts would look good in green, gold, and white. Green Bay is one of the teams I cheer for, going back to the old-timey days of Bart Starr. Yep, I’m old. Bart Starr!!! The magic word. He and I share a birthdate, many years apart. I wanted to be a QB when I grew up. I guess he was my first crush! I wanted to be a linebacker, like Ray Nitschke. When I was a junior in high school, my American history and homeroom teacher was an assistant football coach, and every Monday morning during FB season, he and I would chat for a few minutes about the previous day’s NFL games. He kind of got a kick out of a teen-age girl who knew what “shooting the gap” and “red dogging” were. Anyway, that Spring, the featured speaker at the high school sports conference banquet was none other than Bart Starr (who was still an active player), and my teacher gave me his program from the banquet, which I still have to this day. I was really touched by his thoughtfulness. Great mitts. It must be nice when your knitting season comes around each year!